The 928 essentially has two vacuum systems. One system is based on the variable engine vacuum and includes the fuel pressure regulator, the two fuel pressure dampers, and the automatic transmission. This vacuum is provided from the intake manifold and a problem in this system will create issues with idle, general performance, and harsh A/T shifting. The other system receives constant vacuum from the brake booster via a check valve. From a four-way tee two lines run into the front fender to the cruise control vacuum servo and a vacuum reservoir. Another line runs under the fuel rail to the intake flap control unit, and a black line runs to the HVAC vacuum console under the center console. The intake flap is computer-activated above approximately 3700 RPM to permit better engine breathing, and a non-functional actuator will decrease top-end performance. 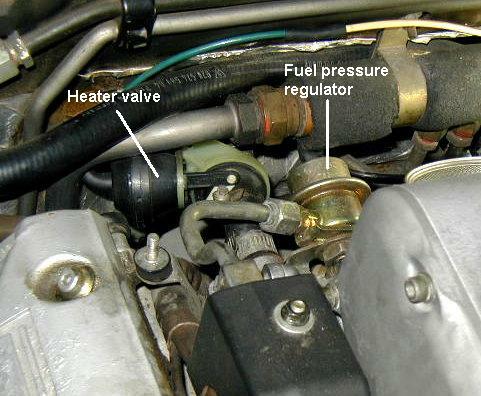 The heater valve shuts off the hot-water/coolant flow through the heater core. If the valve does not shut-off the A/C will feel warm. Above the passenger footwell is a flap which directs outside vs interior air into the HVAC airbox. Interior air is perferred for maximum A/C performance. 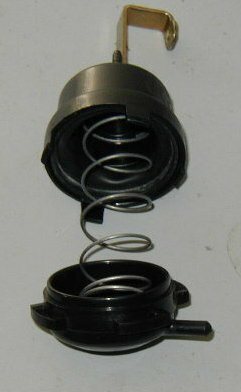 A black plastic "comb" flap inside the center vent assists the mixing of air for temperature control. An inoperative flap is closed which does not allow maximum air flow for A/C cooling. A partially working flap can also flutter making a chattering noise. Heating and cooling air may not flow from the correct vents. A problem with any of these actuators will affect ALL the others. I noticed that my A/C would become warm after running the engine over 4000 RPM - the intake flap controller switched vacuum to the intake actuator (beneath the intake manifold) which had developed a leak. Obtain a vacuum hand pump. The Mityvac brand is often found in most auto parts stores. 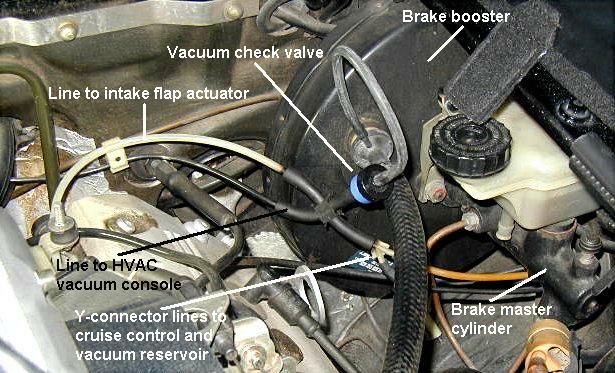 Start with the vacuum check valve under the hood next to the brake booster. The black side should be to the booster; the blue side to the four-way tee. Disconnect the check valve from the tee and test that the valve holds vacuum by putting the vacuum pump to the blue side. Next disconnect the Y-connector to the cruise control and reservoir and test for vacuum. Due to the size of the reservoir your hand/arm will start to ache by the time you draw 10 inches of vacuum (lots of pumping). 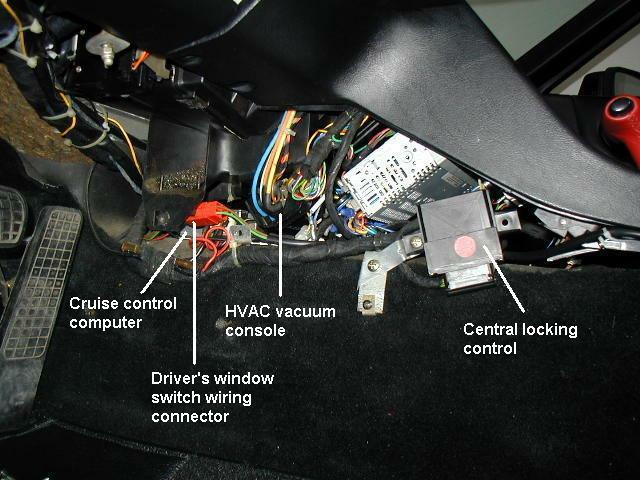 Pull the black line which runs through the firewall under the center console to the HVAC vacuum console and test. Test the line to the intake flap control by pulling the white line. Locate the intake flap control (at top of driver-side cam belt cover, front of the fuel rail) and remove the vacuum hose that runs under the intake manifold to the actuator. You can also remove the round rubber cover on top of the manifold and watch the flap spindle turn as you test. Should this vacuum test fail the manifold will need to be removed to replace the actuator. Remove the engine air intake box and locate the heater valve. Verify that the black side is oriented toward the engine (the valve is uni-directional). Pull the vacuum line (white) from the heater valve and test the valve directly for vacuum. You should see the arm move. For more information see the HVAC Heater valve article. If everything tests good, reconnect and go inside the car. Remove the two side panels from the center console. On the driver's side you will find the vacuum lines for the HVAC system. 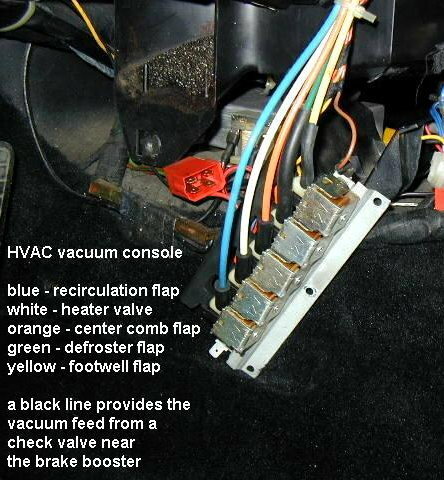 Disconnect the HVAC vacuum console. There are two screws on each side and a third in the rear (difficult to reach). You may need to remove the cruise control brain (from the passenger side) in order to reach the third screw. One by one remove each line and test. The most often-used actuators are the best candidates for failure. When testing the white line look under the hood at the heater valve arm for movement (be aware that the heater valve may function properly but the internal shutoff can warp allowing coolant flow). Two other common failures are the orange and blue lines. The yellow line feeds the footwell flap (generally used to direct heat to the floor). This actuator is located behind the HVAC control head and removing the head should provide adequate access. 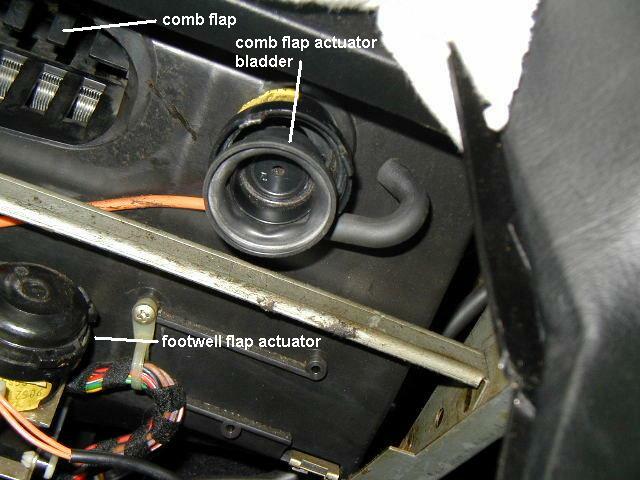 The comb flap actuator (orange line) sits above the footwell flap actuator and cannot be reached without removing the center console. A procedure for removing the center console is here. The easiest way to repair the comb flap actuator is to replace the bladder. 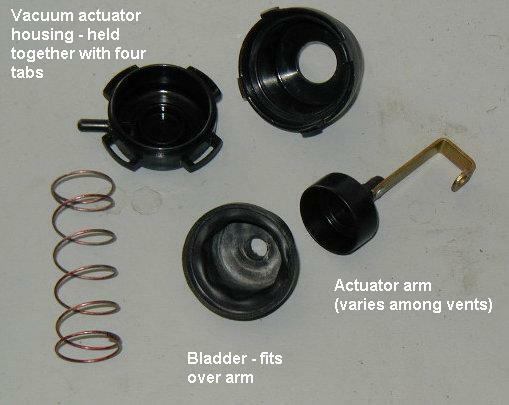 Order a new actuator, disassemble it and the actuator in the dash. When you pry the four tabs beware of the internal spring! 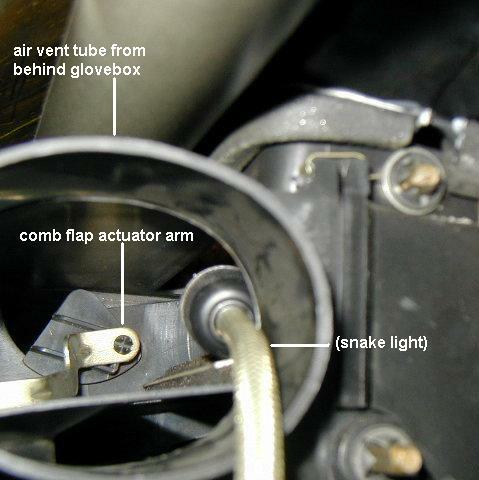 Twist the comb flap bladder/arm to disconnect the arm from the flap mounting inside the airbox. Position the new bladder and arm. Insert a long screw driver or similar tool through the vent tube from the glove box and push the arm onto the mounting pin. The recirculation flap actuator (blue line) operates a door above the passenger storage tray. The blower fan and flap housing must be removed. Instructions are here. If the green line (defroster flap) fails to hold vacuum - Best of Luck!